Around 1800 roughly three per cent of the human population lived in urban areas; by 2030 this number is expected to have gone up to some seventy per cent. This poses problems for traditional religions that are all rooted in rural, small-scale societies. 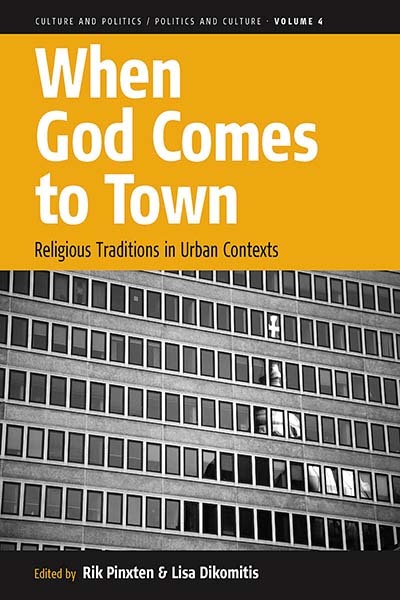 The authors in this volume question what the possible appeal of these old religions, such as Christianity, Judaism, or Islam could be in the new urban environment and, conversely, what impact global urbanization will have on learning and on the performance and nature of ritual. Anthropologists, historians and political scientists have come together in this volume to analyse attempts made by churches and informal groups to adapt to these changes and, at the same time, to explore new ways to study religions in a largely urbanized environment. Rik Pinxten is Professor and Senior Researcher in Anthropology and Head of Department of Comparative Sciences of Culture at Ghent University, Belgium. His current research focus is on identity as a central mechanism in cultural and religious learning processes. He has published widely on the anthropology of knowledge and the comparative study of religion. Lisa Dikomitis is Postdoctoral Researcher at the Hull York Medical School where she works on a project researching social responses to health inequalities. She has published widely about Greek and Turkish Cypriot refugees and is the author of Cyprus and Its Places of Desire. Cultures of Displacement Among Greek and Turkish Cypriot Refugees (IB Tauris, 2012).